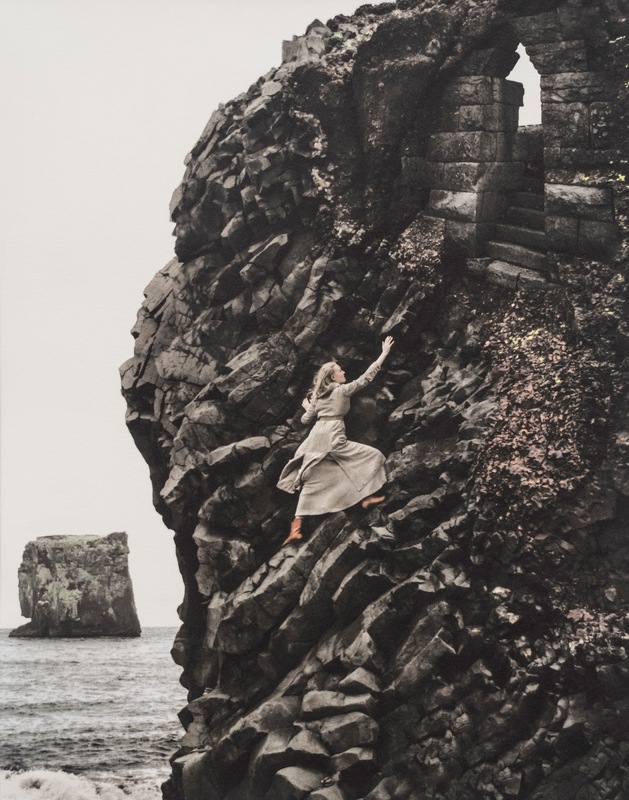 In this stunning photographic and fantastical narrative, Svala’s Saga captures the world on the precipice of extermination. Through the hybrid process of platinum palladium over a digital under-print similar to watercolor, one is swept into a dreamy, chronological fairy tale that relates something profound: the pressing environmental curse of species’ extinction. The surreal and dreamlike plot is about a young woman (Svala) and her discovery that all of the birds are gone. 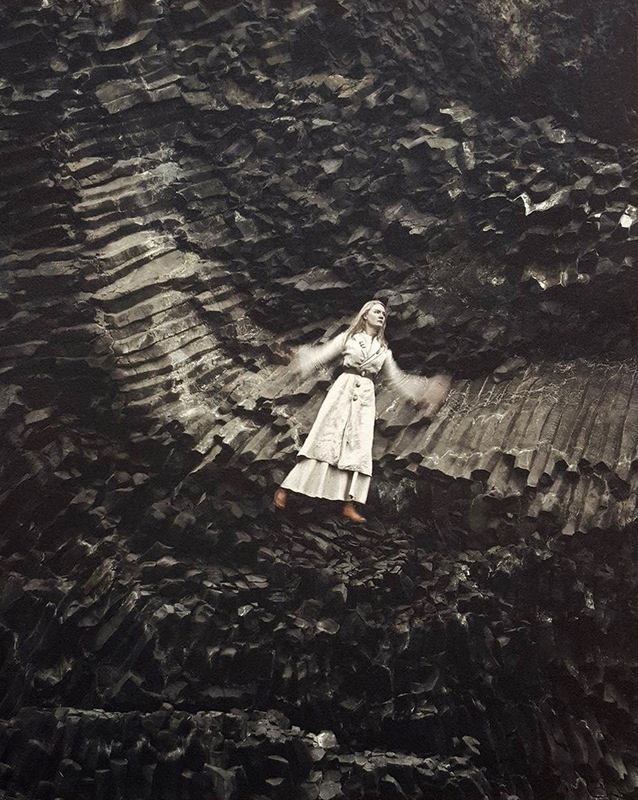 Rather than be overwhelmed by the certitude of the earth’s demise, the viewer joins Svala on her dream-like quest. As we experience Svala’s journey through the wilderness in search for the last remaining eggs, we see her climbing ledges of volcanic flows, standing on the crests of mountainous impasses, at the edge of a crevasse, or atop a glacier. Svala’s small character provides a visual reward when we look closer at the vast landscapes in which she poses. The archetypical motif of Svala’s quest suggests that a lone individual can make a difference towards change through perseverance and determination. 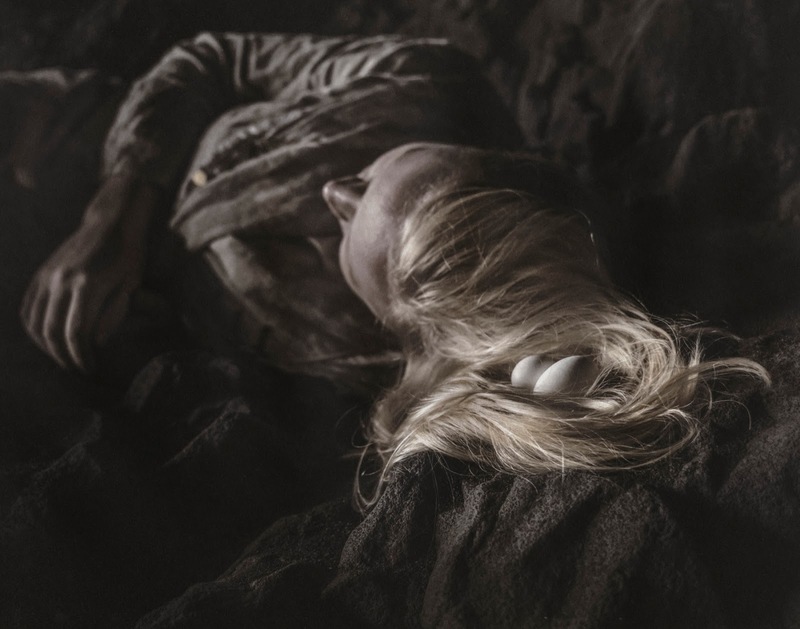 The images take a softer tone as we see the last rescued eggs nested in the character’s tresses. 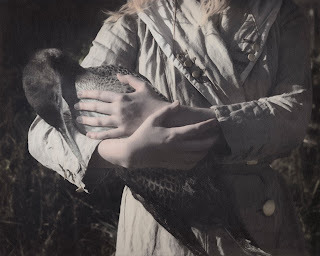 The success of her journey is illustrated in the final images of Svala caressing a bird. Svala’s Saga is a mother/daughter collaboration between photographers Kirsten Hoving and Emma Powell. Although they have worked on informal art projects in the past, they were inspired to create the Svala series after two trips to Iceland. The otherworldly imagery the artists formulated through their joint-vision examines nature's demise. Rather than relying on the shocking images of oil spills, Hoving and Powell seek an alternative medium in which to comment on our environment. Hoving and Powell love the combination of photography, landscape and dreams. Their connective and magical narrative illustrates the tension between mankind and Mother Nature. The photographic balance of vulnerability and fantasy is achieved through a black and white starkness softened by the addition of digital pigment. In the last images of the narrative, this unique combination lends to the storytelling progression. The powerful images encourage the viewer to consider how we fit into our landscape and how we, too, can make an impact. We are also left with a glimmer of hope that Svala’s pursuit to rescue the extinction of a species and save the environment is, indeed, an attainable reality.